Bishop Cynthia Fierro Harvey from the Louisiana Episcopal Area joins others in worship May 7 in Friendship Park on the U.S. side of the border fence. 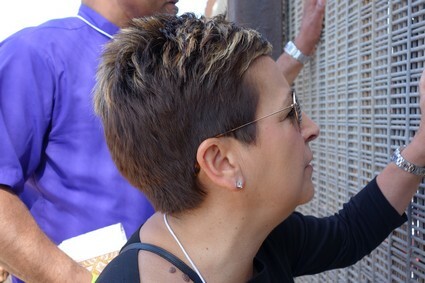 United Methodist bishops from all over the world visit the U.S. - Mexico border to immerse themselves in the reality of life at the Southern border of the U.S. and sharpen their focus on how the church can be in ministry to persons residing there. A UMNS photo. Baton Rouge, La. : As the United States Senate prepares to consider a major bill on immigration policy reform, Bishop Cynthia Fierro Harvey visited the U.S.-Mexico border near San Diego, where she joined other bishops from around the U.S., Africa, Asia and Europe. The purpose of the bishops’ visit on May 7 was to immerse themselves in the reality of life at the border and sharpen their focus on how The United Methodist Church can be in ministry with border residents. Some of the bishops visited the San Ysidro Port of Entry, the busiest border crossing in the world, as well as the border wall, the most striking symbol of U.S. border enforcement policies, and the Plaza de las Americas. Others crossed into Mexico and visited the Plaza del Bordo, an open-air migrant encampment that includes both internal migrants, as well as immigrants who have crossed into the U.S., been detained by the U.S. Border Patrol and have been repatriated or returned to Mexico. The bishops distributed health kits to the community and visited a ministry of the Methodist Church of Mexico. Additionally, they joined for a service of Holy Communion and hiked through the Tijuana Estuary, one of the last undeveloped areas in the region. 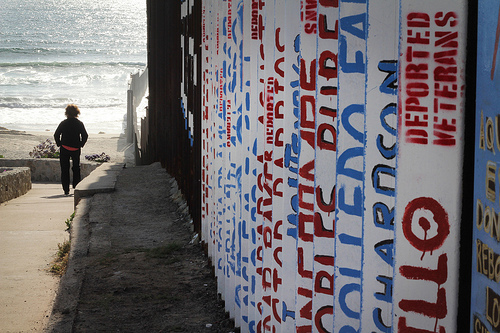 The hike allowed participants to experience a bit of the terrain that immigrants crossing over into the U.S. navigate. Border community leaders, leaders of the Methodist Church of Mexico, area United Methodists and news media joined the bishops during the visit. For more information about The United Methodist Church’s ministries and beliefs regarding immigration, go to umc.org/immigration.